Throw your head back and make this sound: “Koo-koo-koo-koo-koo-kaa-kaa-kaa!” Isn’t that fun? That’s the song of the kookaburra bird of Australia and some nearby islands. The air is filled with their laughing when they roost in the treetops at bedtime and again as the sun rises. One family laughs and another one answers back. They are telling each other, “This is our territory. Stay away!” Kookaburras have six different calls and make great alarm clocks! 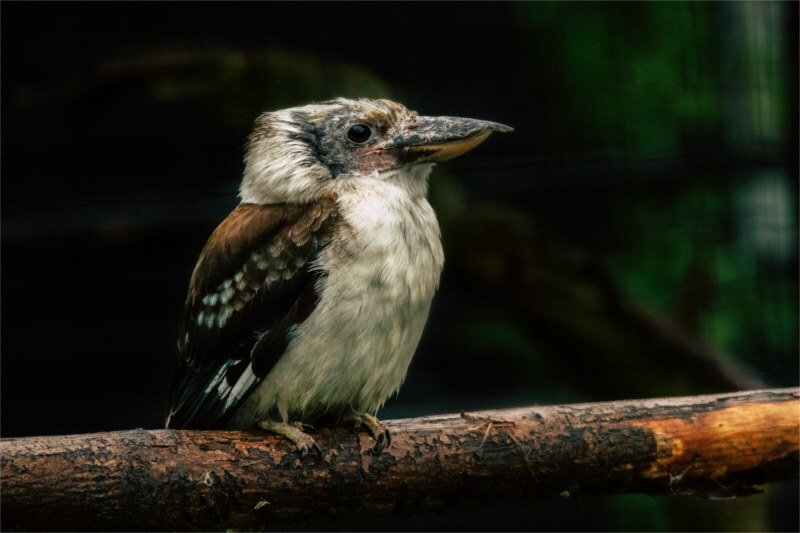 Kookaburras are big birds—higher than your knee! They have short necks and short legs but long, pointed bills. They belong to the kingfisher family but most kookaburras don’t fish. Instead they watch for a snake, pounce on it, grab it behind the head, fly high in the sky and drop it so it dies. Sometimes they hit the snake against a tree then swallow it. They also eat lizards, mice, rats, baby ducklings or chicks and insects. Kookaburras don’t drink any water because they get enough from the food they eat. Mr. and Mrs. Kookaburra live in the woods. They build their nest in a hollow tree and in September the mother lays two, three or four pure white eggs. After three and a half weeks the babies hatch. They have no feathers but in a month they are ready to leave the nest. The babies stay close to their parents and live in very big family groups with their great-great-great-great grandparents who could be 20 years old! Each family member has a job. Some defend their boundaries and some feed and protect the young ones. Did you know the Bible says God laughs? He does! You can read about it in Psalm 2. God wants you to laugh too! He wants you to be full of joy!